The House and the Senate have both approved bills gradually raising the minimum wage until it reaches $15 an hour in 2025. However, the Senate amended the bill to raise the minimum wage more slowly for businesses with 14 or fewer employees. For these businesses, the minimum wage would reach $15 an hour in 2028. The legislation appears to be headed to a conference committee. In a recent letter to legislative leaders, Gov. Larry Hogan said a $15 minimum wage would cost the state 99,000 jobs and $61 billion in economic output over the next decade. His office has not said whether he will veto the bill if it reaches his desk. If he does, it’s likely the legislature has enough votes to override a veto. Raising the legal age to buy tobacco products from 18 to 21 is a priority for Democratic leaders this year. The House and the Senate have each given initial approval to a bill accomplishing that. The Senate version includes an amendment that would allow members of the military to continue buying tobacco products at age 18. The legislation still needs to pass a final vote in either the House or the Senate to meet the Crossover Day deadline. In 2016, Hogan signed an executive order requiring public schools to begin the academic year after Labor Day and end before June 15. The move prompted an outcry from some local school officials. They say they may have to shorten mid-year breaks or eliminate existing school holidays to comply with the order while still ensuring that students are in class for the legally mandated 180 days. Both the House and the Senate have passed a bill undoing that executive order and returning calendar-setting decisions to local school boards. 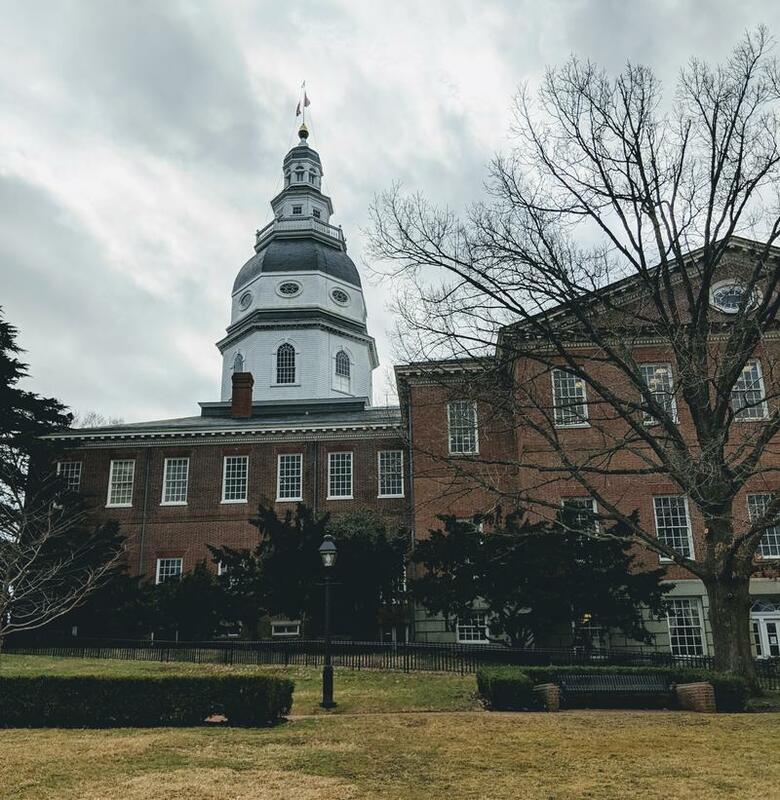 Hogan has promised that the bill will be petitioned to the ballot at the next election, so the House amended the bill to include the language that would be used on the ballot should that happen. The Senate requested an opinion from the Attorney General’s Office to determine whether the legislature can pre-write the ballot language, and the body is expected to vote on the amended version of the bill on Monday. Regardless, the legislation has already met the Crossover Day deadline. The Baltimore House delegation rejected a bill allowing police officers to carry guns while patrolling in Baltimore schools. As a result, this legislation is not moving forward this year. On the other hand, the House of Delegates passed a bill barring local school boards or any public schools from using funds to directly or indirectly give teachers guns or train teachers in the use of guns. The Senate version of the bill has not moved out of the Education, Health and Environmental Affairs Committee. The House gave initial approval to a bill prohibiting someone from buying, selling or owning a 3D-printed gun unless it has a serial number issued by a licensed firearm importer or manufacturer. It also requires the State Police to come up with recommendations for dealing with 3D-printed guns that don’t have serial numbers. The bill still needs a final vote in the House to make the Crossover Day deadline. A bill creating a license for long guns, similar to the licenses required for handgun purchases, has been significantly watered down. The amended bill requires background checks for all purchases of long guns, such as rifles and shotguns, closing a loophole in the existing law that does not require background checks for private sales of these guns. The bill gained initial approval in the House and just needs a final vote to make the Crossover Day deadline. The Senate passed a bill authorizing Johns Hopkins University to create its own private police force. The House version of the bill has not made it out of committee. A bill sponsored by Del. Joseline Peña-Melnyk would have created in state law a mandate to buy health insurance and fined people who don’t have insurance. The House Health and Government Operations Committee altered the bill to remove the mandate and the fine. Under the amended version of the bill, the Comptroller’s Office would offer uninsured taxpayers who qualify for Medicaid or other no-cost or low-cost health insurance options information about those options. The bill passed the House on Saturday. The Senate version of the original bill has not moved out of the Senate Finance Committee. The Senate is expected to consider on Monday a bill that would require Maryland to get 50 percent of its electricity from renewable sources, such as wind, solar and hydroelectric. To make the Crossover Day deadline, the bill would need to get two different votes on the Senate floor. The House version of the legislation is stuck in the House Economic Matters Committee. Both the House and the Senate have passed legislation banning polystyrene — or foam — plates, cups and takeout containers. The versions are slightly different, and the two chambers need to come to an agreement before the bill can be sent to Hogan’s desk. Legislation that reflects the findings of the Commission on Innovation and Excellence in Education — nicknamed the Kirwan Commission for its chair, former University System of Maryland Chancellor William “Brit” Kirwan — is a key priority for Democratic leadership. The bill requires the state allocate $325 million in new school funding for the coming fiscal year and roughly $750 million for fiscal 2021. The money is meant to cover expanded full-day prekindergarten, extra supports for schools with high concentrations of poverty, and raises for teachers. The bill has not made it out of the House or Senate committees that are considering it, but for legislation that’s a top priority for leadership, the Crossover Day deadline doesn’t really apply. That said, Hogan has warned that he does not support the legislation as it was introduced because it does not sufficiently hold school systems accountable for how they spend the new funding.